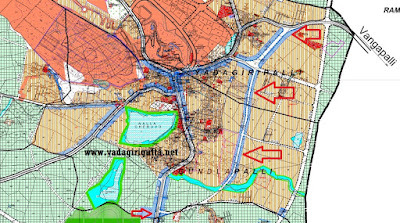 Population : Where as presently showing the residential area only 10% of the whole land in YTDA limits of 6 villages and total population of 33,781 (as per 2011 Census), Master plan proposing to add 43% as urbanisable area and expecting the population 51,000 (by 2035) and floating public, tourist, pilgrims may visit 1,00,000 per day in coming years, based on this may whole master plan designed. 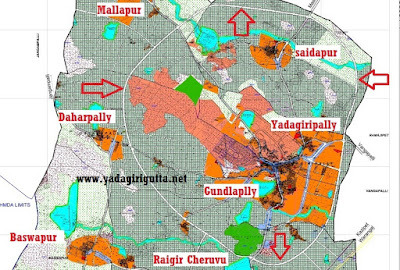 Yadadri Ring Road : A new Ring Road is proposed to connect all 43% proposed urbanisable area which also connected to 4 sides of Yadagirigutta Roads which are Hyderbad Road, Warangal Road, ECIL Road, and Cheriyal Roads. it goes through Saidapur-Masipet Border to Yadagiripally Shivaru, Back side of Surendrapuri to Raigir Katta to Datharpally East side to Mallpur south side and to saidaur. 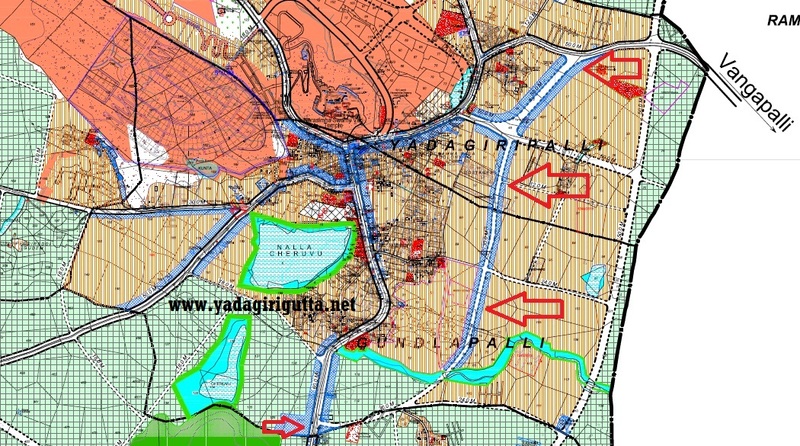 Yadagiripally Bypass Road : A new Bypass Road to Yadagiripally Villege is proposed which connect Warangal (Wangapally) Road at Hayagreeva Temple to Wadaigudem X Road on Hyderbad Road. and also proposed all link roads to upcoming urbanisable area on this new way. 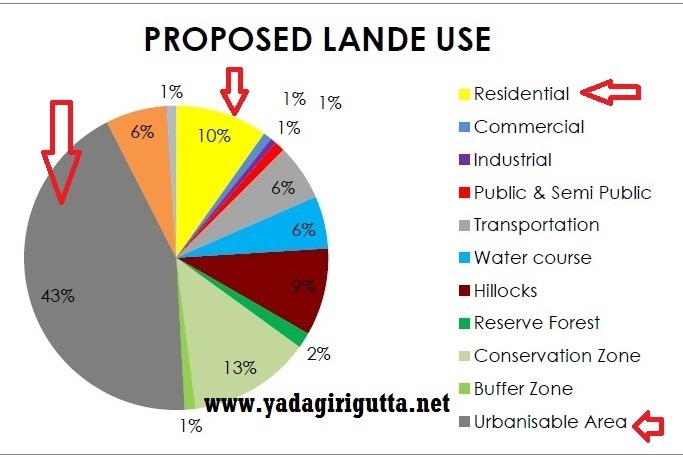 • Quantity of Water Supply should be increased by 3.25 MLD at present and for the projected population 15.8 MLD should be increased by the year 2035. • Source of Water Supply should be taken by BHAGEERATHA MISSION. • Household connections should be improved by no. 20,200 for the year 2035 . • Underground sewerage system should be provided for YTDA area. • Sewerage Treatment Plant should be proposed. • 100% Sanitation facilities should be provided. • 100% door to door collection should be provided and segregation of solid waste should be provided. • Landfill sites yet to be provided in Datharpalli and Baswapur. MMTS which already approved also mentioned. 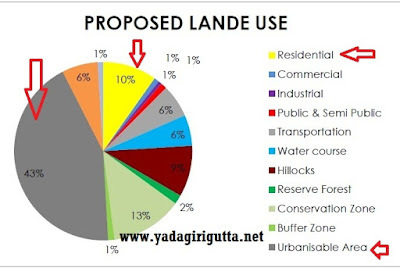 More roads, more connectivity, more development of the areas is showing in the plan, but dont know how many of these will come true Since Yadadri Town is facing main Traffic, Swerage, Solid Waste problems from last few decades. 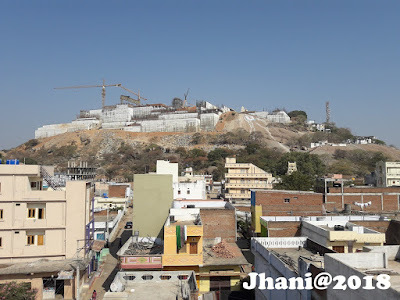 we have a hope that in the Hon'ble Telangana CM KCR's vision, this town dafinatly will become a great destination to all pilgrims and tourists in coming days.